McBride, Genevieve G., and Byers, Stephen R. ‘Dear Mrs. Griggs’: Women Readers Pour Out Their Hearts in the Heartland. Marquette University Press, 2014. McBride, Genevieve G., and Byers, Stephen R. “On the Front Page in the ‘Jazz Age’: Journalist Ione Quinby, Chicago’s Ageless ‘Girl Reporter’.” Journal of the Illinois State Historical Society 106.1 Ed. 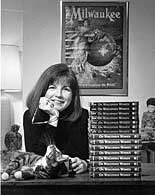 McMahon, Eileen M. (2013): 91-128. McBride, Genevieve G. “Helpmeets, Hausfraus, Hellions, and More: The Missing Majority in Milwaukee History.” Perspectives on Milwaukee’s Past. Ed. Anderson, Margo L., and Greene, Victor L. University of Illinois Press, (2009): 192-218. McBride, Genevieve G., and Byers, Stephen R. “The First Mayor of Black Milwaukee: J. Anthony Josey.” Wisconsin Magazine of History 91.2 (2008): 2-15. McBride, Genevieve G., ed. Women’s Wisconsin: From Native Matriarchies to the New Millennium. Wisconsin Historical Society, 2005. McBride, Genevieve G. On Wisconsin Women: Working for Their Rights from Settlement to Suffrage. University of Wisconsin Press, 1995.